CRAZY COOL GROOVY!!! 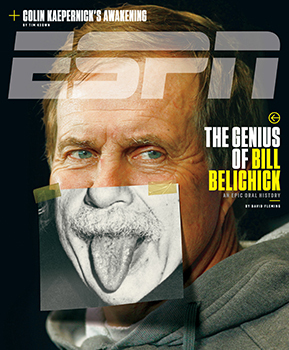 : BILL BELICHICK On ESPN MAG!!! The good folks at ESPN have analyzed and dissected NEW ENGLAND PATRIOTS Head Coach BILL BELICHICK, and gifted us with The GENIUS Of BILL BELICHICK for the new issue of ESPN The MAGAZINE!!! Also, find out why ESPN MAG Journalist TIM KEOWN says, COLIN KAEPERNICK IS A REAL AMERICAN.